Try Again: sets up retrial attempts for a call as specified by the administrator. The retrial call is placed back in the queue and offered to any available agent within the specified time interval. For example, if you fail to reach the called party during a campaign call, you can select a transaction code such as Ring, No answer, or Reached third party, which maps to the Try Again disposition action, triggering retrial attempts for the call. Schedule Call back: allows scheduling a callback to a campaign customer, and pops up a reminder at the scheduled time to the same agent. The agent must manually place a call. For example, on reaching a destination number, if a customer suggests a time to call back, you can select a code to schedule a callback based on the customer’s convenience. If you select a transaction code that triggers Schedule Call back, you are prompted to schedule a time for the callback using the calendar. 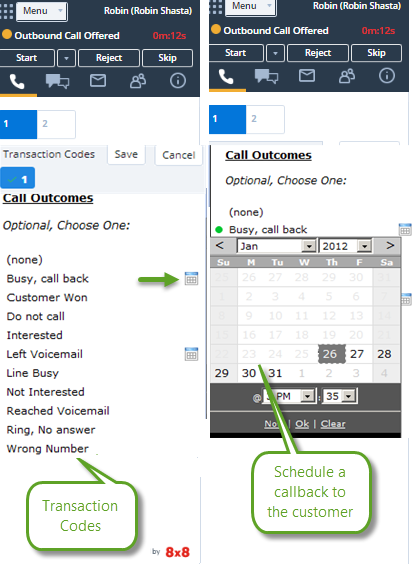 Specify a date and time to call back, and a task is automatically created for the call. A reminder pops up a few minutes before the specified scheduled call with the call log. Click the call log to view the details of the scheduled call. The agent has to manually place the call to complete the task, and dismiss the task in the Reminder window. the code is mapped to the Do not call disposition action. the campaign defines a field to capture the transaction code. The Do not call disposition information is critical to filter the record from the campaign call list for recycling.